About a year or two after college, I found myself unemployed. I quit my job because I had an idiot boss and I figured I’d find another job without a problem. Well… let’s just say that was not a well thought out plan. Of course I still had all my trains, but I didn't really want to part with them. Luckily, another well thought out plan came to mind. I’ll put an ad in the paper “Wanted to Buy: Trains". Then I could buy trains, sell them, pay the rent, buy food, and have enough money left over to buy more trains. Somehow, someway, and with a little help from a new invention called the internet, that hare-brained idea actually worked. I did end up getting another job and after a year and a half of that nonsense I quit to sell trains full time at Sommerfeld’s Trains in Butler, WI. 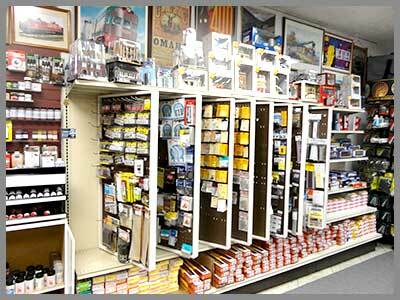 Later on, in 2007 and with Jack Sommerfeld’s help, we bought Jerry’s Bay View Hobbies in Milwaukee, and by 2008 I was able to purchase the store for myself and renamed it South Side Trains. It was a tough, but I made it through the early years. Fortunately, in 2011 I was able to buy our current building and it’s now the permanent home of South Side Trains. I've been lucky in this endeavor, and it’s all been possible through the positive encouragement from my family, friends, and customers – I couldn't have done it without you, - thank you!